This time of year has special significance to my family, as it does for all who call themselves Christian. Easter acknowledges what William F. Albright and Sir William Ramsey claim is one of the most documented historical events in ancient history: the resurrection of one Jesus of Nazareth. For Christians, Holy Week, Paschal Triduum, Good Friday, and Easter are significant to us not because of the historicity of the event, but because of what it represents theologically. However, institutionally and as a nation, we are not a theocracy. And the salvific precepts of holy writ cannot be imposed on an institution, a government, or a nation. The difficulty in imposing such values on our government, for example, becomes obvious when we acknowledge what the two greatest commandments are love of God and love of our fellow man. How can an institution, or a government, love? Plus, the politically-correct among us demand that our Christian values are to be kept as far away from government as possible. To them, there is to be a “wall of separation” between the two. Hence, to use Judeo-Christian values as an argument for government control of our health-care is disingenuous at best. In the context of the health-care debate, some have attempted to impose onto government what was clearly intended as private morality based upon a fundamental belief in God. Christ’s message was to individuals. As individuals we are, as Paul said, to work out our salvation before God. Institutions have no redemption to seek and no grace to secure. And if Christ had intended for governments to abide by the deeply personal morality he was conveying to his disciples, he would have been promulgating his message to the Sanhedrin and the Roman leaders of his time, not to the primarily lower class residents of Judea. Even our founding fathers recognized this crucial distinction. John Adams said, “It is religion and morality alone which can establish the principles upon which freedom can securely stand. The only foundation of a free constitution is pure virtue.” We have become increasingly corrupt as a culture, as ethics have morphed into relative or situational rather than absolute principles. Fundamental to the Judeo-Christian value system is the free agency to choose for ourselves. Institutions don’t make teleological or eschatological decisions, individuals do. When institutions attempt to co-opt a belief system and then forcibly execute it on the public, it is not moral, but rather immoral. The First Amendment legally precludes Congress from doing that very thing. This is singularly important in the discussion regarding health-care reform. Some in the public dialogue, including some letters submitted to the Journal editor, attempt to apply a Christian morality on the government, that it is the role of government to redistribute wealth, provide health care to all, and provide a cradle to grave security for all Americans. It was this concept of security provided by government that Benjamin Franklin referred to many times, one variation of which is found at the base of the Statue of Liberty. “They that can give up essential liberty to obtain a little safety deserve neither liberty nor safety.” During the early days of the Patriot Act, those among us who were so concerned that George Bush and Homeland Security would be listening in on their overseas calls to terrorists or monitoring the sordid and questionable books they check out from the public library, were obsessed with this line. They were convinced they were sacrificing their liberty for their security. That security, however, is mandated by the Constitution. It’s called national security. The security Franklin was denouncing was the security bought with our liberty: sacrificing personal freedom for the security of governmental control over our lives. When government completely controls our health-care, who can deny that we have sacrificed immense personal liberty? I don’t know anyone who doesn’t see problems with health-care costs. What emerged from Congress was the wrong prescription for the health-care ailments afflicting the nation. 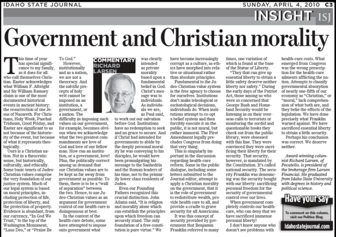 Attempts to classify governmental absorption of nearly one-fifth of our economy as “Christian,” or “moral,” lack comprehension of what both are, and they belie the affects of the legislation. We have done precisely what Franklin warned against. We have sacrificed essential liberty to obtain a little security. Perhaps his conclusion was correct. We deserve neither.